In 1686, two years after the unsuccessful siege of Buda, a renewed campaign began to enter the Hungarian capital. This time, the Holy League's army was twice as large with over 74,000 men, including German, Hungarian, Croatian, Dutch, English, Spanish, Czech, Italian, French, Burgundian, Danish and Swedish soldiers, along with other Europeans as volunteers, artillerymen, and officers. By the middle of June 1686, the siege had begun. A Turkish relief army arrived at Buda in the middle of August, but Abdurrahman Abdi Paşa shrank from the large-scale attack against the siege army, and on 2 September 1686 came upon the resisting Generalsturm (General's Tower) at the fortress. The commanders in chief were Charles Duke V of Lorraine (1643–1690) and Maximilan II Emanuel Elector of Bavaria (1679–1726). Prince Eugene of Savoy and his dragoons were not directly involved in entering the city, but secured the rear of their army against the Turkish relief army, which could not prevent the city from being entered after 145 years in Turkish possession. This engraving by Romeyn de Hooghe represents the great explosion of 22 July 1686, the dramatic and decisive event of the attack, showing a partly fictitious topography of the city. The commanders in chief with their army are represented in the foreground Pest-side, while besides them in Pest and in Buda, are their camps and attacking battle corps, with the city of Buda on fire and in ruins, and Gellért Hill on the far left. 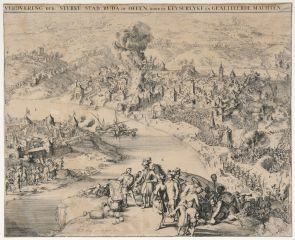 This print by Romeyn de Hooghe is the most famous of numerous representations of the recapture of Buda in 1686. It depicts a topographical, partly exact bird’s eye view, with a Baroque battle scene complete with representations of the commanders in chief in the foreground, and the castle and city of Buda on fire, in the background. Transferred from the Capital’s collection in 1945. Rózsa, G., Budapest régi látképei, Budapest (Old Vedute of Budapest: Budapest, 1963, No. 104), 1963, cat. 104. Rózsa, G., Romeyn de Hooghe und die Türkenkriege in Ungarn (Romeyn de Hooghe and the Turkish Wars in Hungary), Oud-Holland, 1962, pp. 102–103, 107. Landwehr, J., Romeyn de Hooghe the Etcher. Contemporary Portrait of Europe, Leiden, 1973, p. 129. Budapest az Újkorban (Budapest in Modern Times), (ed. G. Szvoboda Dománszky), Budapest, 1995, p. 17.